I decided to play in a Postage Stamp Art-athon this weekend at atcsforall.com in the hopes that it got my muse activated. An Art-athon is an art marathon where we "hang out" together online and "chat" and sometimes trade art... and I've actually made a few ATCs! While I do trade some ATCs, there are a few I like so much, I cannot trade them away. This one in particular will be framed and in my studio. The background is an abstract on watercolor paper that I didn't like so I cut it into ATC backgrounds. 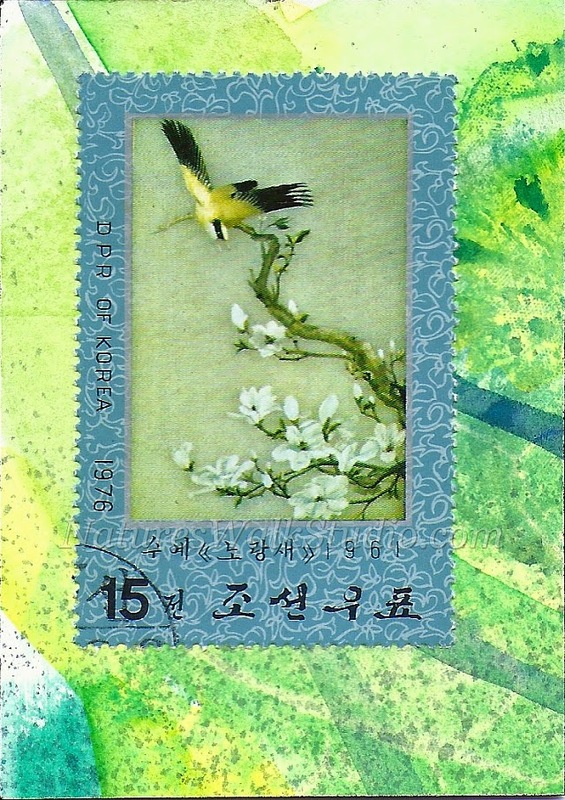 I adore that bird stamp, it's so lovely! And when I saw this particular background, well, that was that. 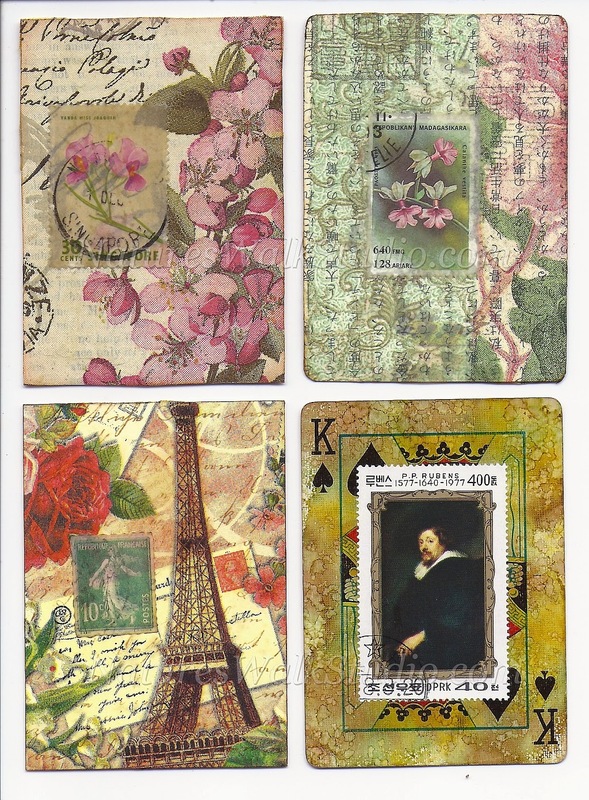 Here are some of my "trade-able" favorites ATCs. I've collected some pretty awesome stamps over the past few years, specifically to use in my collage art. Fortunately, I have a friend who sells fabulous used postage stamps on Etsy, so I can feed my addiction. Check out LarkroseInspirations if you also love to use old stamps in your work. Thanks for stopping by! To my American Friends, have a wonderful 4th of July! Picture perfect. Very nice. I also love your blooming bee balm. It's wonderful. Have a safe and great Fourth. Wow this is really quite beautiful. Well done. I can see why toy want to hold onto the bird atc-beautiful. I love the bright abstract background. They're all lovely in fact-a clever idea to alter the playng card. they are all gorgeous! !each one a masterpiece! Wow such gorgeous atc's....so romantic and pretty! My first foray into internet art was through ATCs. I have 2 or 3 albums of them. Yours are gorgeous. No wonder it's hard to trade them off. I love all of your work! Wonderful romantic feel and the green one is really stunning! You create a very special mood in each of them! Happy PPF! From my Garden - Bee Balm!